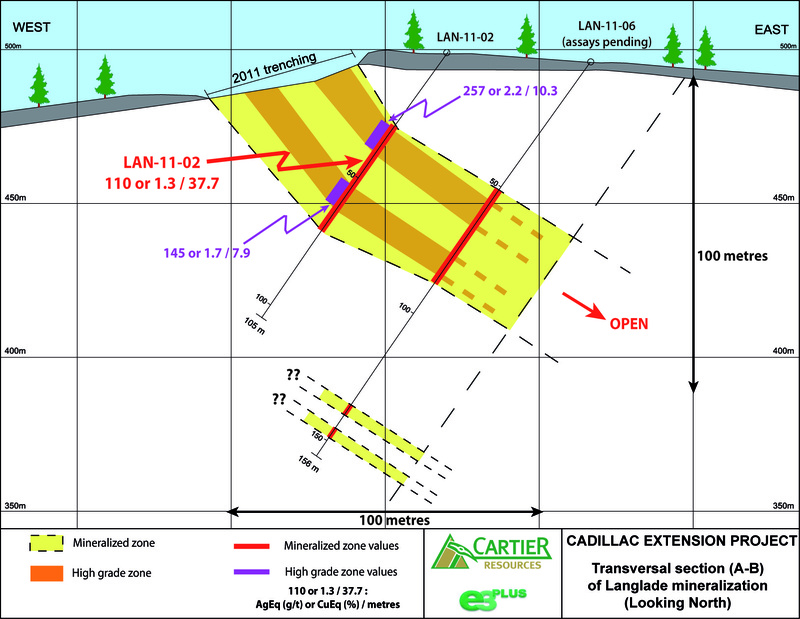 VAL-D'OR, QUEBEC--(Marketwire - Feb. 7, 2012) - Cartier Resources Inc. (TSX VENTURE:ECR) ("Cartier") announces its first diamond drill results for the Langlade Deposit on the Cadillac Extension project. Intersections with massive sulphides graded up to 322 g/t Silver Equivalent (AgEq) or 3.7% Copper Equivalent (CuEq) over 3.5 meters included within a broader interval grading 110 g/t AgEq or 1.3% CuEq over 37.7 meters. The first phase of drilling consisted of 10 drill holes for a total of 1 238 meters. The results of 3 holes are presented in the table below and on the 3 figures. The copper-zinc-silver-gold mineralization observed at a depth of 30 meters in the first phase of drilling is similar to that observed at surface in the trenches. « The excellent correlation between massive sulphide sections observed in the trenches and drilling suggest that the potential remains open at depth as well as to the north-west and south ». 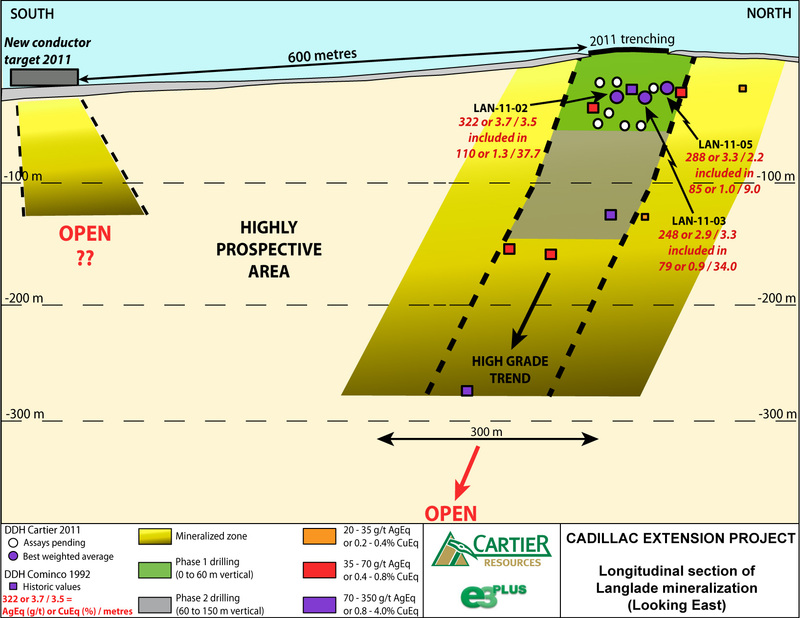 A second phase of drilling at Langlade will commence soon and targets both the depth and lateral extensions of the mineralization. « We are pleased with these results and expect that those pending will confirm our initial choice of focussing our first drilling efforts on Langlade » added M. Cloutier. « Furthermore, in order to deal with the unusually long delays at the assay laboratories, we have scanned all drill cores from the recent program with the new Core MappeR™ innovative imagery system from Photonic Knowledge ». AgEq and CuEq calculation represents the total metal value for each metal, multiplied by the conversion factor, summed and expressed in equivalent silver grade. These results are exploration results only and no allowance is made for metallurgical recoveries. The conversion factors used were: 1 kilogram (kg) = 2.2046 pounds (lbs.) and 1 troy ounce/ short ton = 29.16 grams (g). The AgEq and CuEq calculation was done using the following 2011 average metal prices: price of copper = 4.0$/lb., price of zinc = 1.0$/lb., price of silver = 35$/oz and price of gold = 1,561$/oz. The exploration program and the technical information presented in this press release have been reviewed and approved by Mr. Philippe Berthelot, P. Geo., and Vice President Exploration for Cartier. Mr. Berthelot is a qualified person as defined by National Instrument 43-101. 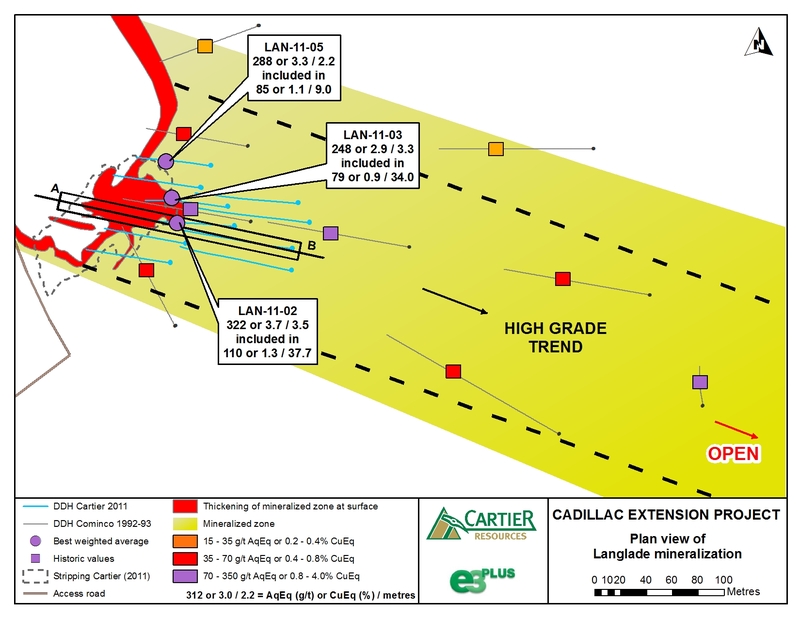 The Cadillac Extension exploration program is conducted under the supervision of Mr. Berthelot. Cartier has implemented and adheres to a strict Quality Assurance / Quality Control program which includes mineralized standards and blanks for each batch of samples. Assay samples are taken from drill core sawed in half with one half sent to a commercial laboratory and the other half retained for future reference. Analyses are either performed by Techni-lab S.G.B. Abitibi Inc. (ACTLABS) in Sainte-Germaine, Quebec, an accredited laboratory. The company's objective is to set up a dynamic process which will allow it to develop and maintain a balanced portfolio of mining projects ranging from exploration to resource definition, development and production. Its VISION is to develop the company's current and future assets into near to medium term mineral production with a schedule consistent with its human and financial resources and respecting sustainable development practices.